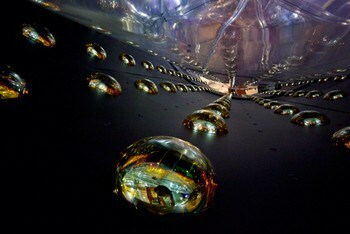 An international team of physicists—including several from the California Institute of Technology (Caltech)—has detected and measured, for the first time, a transformation of one particular type of neutrino into another type. The finding, physicists say, may help solve some of the biggest mysteries about the universe, such as why the universe contains more matter than antimatter—a phenomenon that explains why stars, planets, and people exist at all. The results, released online on March 8, come from the Daya Bay Reactor Neutrino Experiment, which consists of six 20-ton neutrino detectors lying beneath the mountains of southern China near Hong Kong. The paper in which the team reports its data has been submitted to the journal Physical Review Letters. Neutrinos are fundamental, uncharged particles that zip through space at near-light speed, barely interacting with any other particles. In fact, billions of neutrinos are streaming through your body at this very second. Neutrinos come in three types (or “flavors”)—electron, muon, and tau—and can transform from one type to another via a process that is described by variables called mixing angles. There are three mixing angles, two of which have been previously measured; McKeown was part of the KamLAND experiment in Japan that helped determine the second of these mixing angles several years ago. But an accurate measurement of the third, called θ13 (“theta one three”), which describes how an electron neutrino transforms into the other flavors, has eluded physicists. Thanks to the Daya Bay Experiment, physicists have finally pinned down a precise number to describe the transformation. Having measured all three mixing angles, physicists can now pursue the next set of ambitious experiments to study what is called CP violation, or charge-conjugation and parity violation, says McKeown. If CP violation is true, then particle reactions can occur at rates that differ from those of reactions involving the particles’ antimatter counterparts. In theory, the Big Bang should have produced equal amounts of matter and antimatter, with collisions between the two subsequently annihilating both. Had that been the case, however, there would be no stars, planets, people, or anything else made of matter. But CP violation, the thought goes, enabled the universe to have more matter than antimatter. The Daya Bay Reactor Neutrino Experiment’s six liquid-filled cylinders detect antineutrinos—the antimatter partner of the neutrino—produced by nuclear reactors in the nearby China Guangdong Nuclear Power Group. Three neutrino detectors sit about 400 meters (about a quarter of a mile) from the nuclear reactors, while the other three are located about 1700 meters (just over a mile) away. The nuclear reactions that occur inside the energy-producing reactors produce electron antineutrinos, which can be observed by both sets of detectors. The far set of detectors measure fewer electron antineutrinos than expected because a fraction of the electron antineutrinos transform into muon and tau antineutrinos in mid-flight. The detectors cannot directly observe these muon or tau antineutrinos, but by measuring the fraction of “missing” electron antineutrinos, researchers can determine the θ13 mixing angle. In their experiments, the physicists found that the far set of detectors observed 6 percent fewer electron antineutrinos than expected, giving them the information needed to precisely calculate the value of θ13—which turned out to be 8.8 degrees. McKeown and the Caltech group designed and built the calibration devices (three for each detector) that enabled their colleagues to understand how well the detectors would work and other crucial properties of the instruments. The other Caltech members of the Daya Bay Collaboration are staff scientist Robert Carr, senior postdoctoral scholar in physics Dan Dwyer, Robert A. Millikan Postdoctoral Scholar in Experimental Physics Xin Qian, graduate student Hei Man (Raymond) Tsang, and postdoctoral scholar in physics Fenfang Wu. Funding for the Caltech team was provided by the National Science Foundation. The Daya Bay Collaboration involves nearly 300 researchers from 38 institutions around the world, with major contributions from—in addition to Caltech—China’s Institute of High Energy Physics, Lawrence Berkeley National Laboratory, Brookhaven National Laboratory, and the University of Wisconsin, Madison.